The HJC IS-33 II helmet is one of the more popular helmets that we do custom headset installations. Choose from one of the Bluetooth Headsets from Sena or Scala Rider for wireless communications between riders. Or choose a Corded Headset option for on board communication systems for the Honda Goldwing, Harley Davidson, BMW and others. No matter what your communication needs, The Helmet Shop can help. We can do custom helmet headset installations like this on most all helmets we sell. We offer free shipping on all of our helmet headset combinations. We also use our buying power to pass on big savings to our customers making our prices hard to beat. 47792.4 in reply to 47792.2 Report on new helmet: Quiet: a surprise compared to my old HJC IS33 Headset speakers: Very good sound quality, and that is with the cloth covering them too, at the ear space Clear face shield : Much better quality shield that older model. Sun shield: better quality, and it doesn't come down so far it hits your nose, which my old helmet did There was a Peak Visor in the helmet box too. I forgot to mention that earlier. So if I want to not use the face shield and just ride with the Visor, it's very easy to change out the face shield. I didn't find anything I didn't like about the helmet on the ride I made yesterday. I'm still so excited about finding what I think is a great helmet deal. I am so impressed with the increased quality level on the HJC IS 33II, compared to the older model IS 33. Q: What is difference between this helmet with 7 pin wired head set and IMC-1533? Will it work on a 2002 Electraglide, Ultra Classic? A: Yes, this HJC IS-33II custom headset helmet with a Harley cord option will work with your 2002 electraglide, all Harley Davidson bikes have a 7 pin plug connection. Q: What is the difference between this HJC IS-33 II with an IMC HS-H160 headset installed for $209.99 and the HJC IS-33 II with IMC headset installed for $224 at the top of the page? A: The only difference is that the $224.00 package deal is an integraded, meaning is clampless, the pigtail where you would plug in your lower cord comes from inside as seen on the picture, the lesser price option comes with a non-intergraded headset. Q: Does this Helmet come with a full shield also? A: Joe, Yes the IS-33 Helmet has an internal Smoke drop down sun visor and a full exterior clear shield. The full shield can be removed and replaced with a peak visor that is also included in the package. A: IMC-IS33 is a part number, no difference, yes it will work for your 2002 bike. Q: I currently wear an HJC IS-MAX modular helmet. I had to select 3XL size for it to fit with my headset for my Goldwing. In measuring my head, it indicates a 2XL would be the size choice. Is there that much variation in HJC sizing? I want to go open face because of wearing glasses and clearance for the mic. What is your return policy? Thank you. A: Let me start by saying that the size chart always leans toward the tight fit. You may measure as a 2XL but the 3XL may be the more comfortable fit. The speakers are recessed, so you do not need to factor in the room the headset may take up. 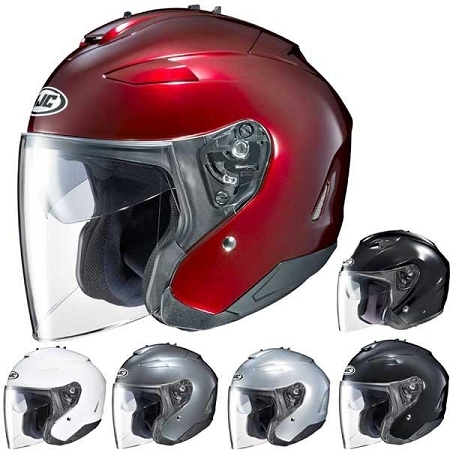 We do allow up to 30 days to exchange the motorcycle helmets as long as they are in new condition. Q: Yes I am looking at IS-3311 Large helmet. in red ,but don't want face shield. want fold down sun visor. Do not want blue tooth. What will cost? Yes, This helmet does come with a 7 pin Headset for the Harley Davidson Motorcycle. There are 3 options Harley, Gold Wing or BMW. Just choose the Harley Davidson from the drop down box and we will send you the Harley Davidson compatible helmet. Aerodynamic shell with large eyeport for greater visibility. Impact absorbing, single-density EPS liner. One-Touch integrated smoke-tinted SunShield deploys and retracts quickly and easily. ACS Advanced Channeling Ventilation System provides flow-through ventilation. flushes heat and humidity out of the helmet. Moisture-Wicking and odor-free interior with advanced SuperCool® antibacterial fabric. Grooved interior in the temple area for riders who wear glasses. HJ-17R Shield and QuickSlide? Shield Replacement System.